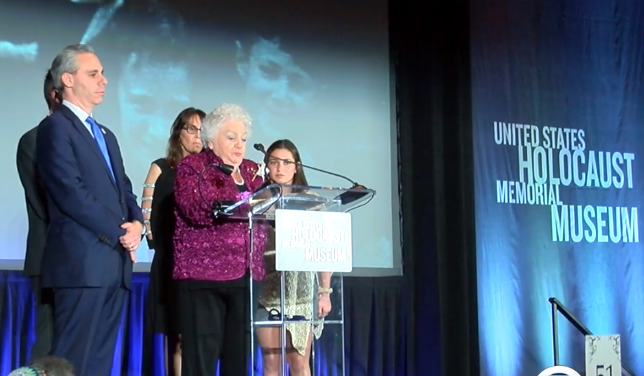 BOCA RATON, Fla. — A Boca Raton woman and Holocaust survivor was honored Tuesday night by the U.S. Holocaust Memorial Museum. Rita Hilton was given the national Elie Wiesel Award at the Boca West Country Club. She spoke with WPTV on Monday ahead of the ceremony. Representatives from the museum say Hilton goes above and beyond by not only sharing her survival story, but by being an educator and active member in the Jewish community. "I'm thinking about my mother. I'm thinking about my husband, and my grandfather. They would've been proud of me," said Hilton. As Hilton took the stage, she was escorted by two students, and a teacher from Marjory Stoneman Douglas High School. They then took a moment to light candles and vowed to always keep the memories of Holocaust survivors alive.